We provide design solutions and marketing concepts to enhance and support our clients’ outreach to their customer base, building their internet profile, increasing their presence and marketing to their audience efficiently, effectively and profitably. 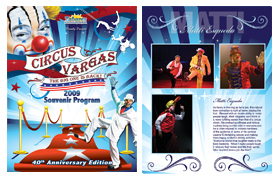 With a combined 40+ years of related business experience, managing partners Diane Arata Arthurs and Rolanda Kaiser Andrade consider the circus and entertainment industry their specialty! Demanding a unique approach and intimate knowledge of the industry, Arata Entertainment Concepts and Design is your top solutions provider and only choice for a successful and lucrative marketing campaign.